Shirley Moore lives in Cougar Village at Southern Illinois University Edwardsville with her husband and four children. The SIUE senior, majoring in social work, said she was grateful to learn about the University’s outreach efforts to food insecure students during the Thanksgiving holiday. 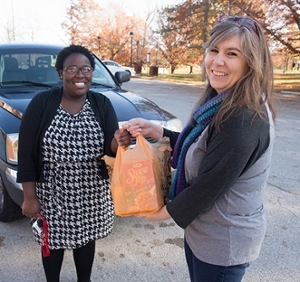 The SIUE Sociology Club hosted a Cougar Thanksgiving Food Drive, led by senior Jalela Mitchell. The Sociology Club then sponsored the “basket giveaway,” which were handed out to help food insecure students. Monday, Nov. 20 is the last day that students can receive Thanksgiving food donations before the holiday. SIUE Senior Shirley Moore receives a Thanksgiving “basket” of groceries from Connie Frey Spurlock, PhD, associate professor in the Department of Sociology and Criminal Justice Studies and faculty partner with the Cougar Thanksgiving Food Drive.